Poor Mike! Late for work! But with so many new cars being added to the roads everyday, traffic jams in Beijing have worsened in recent years. The situation on the capital's major thoroughfares are so bad that devising ways of beating the peak-hour crush is the only thing on people's minds when they awake in the morning. Mài kè: Duì bù qĭ, wŏ lái wăn le, ràng nĭ jiŭ děng le. I'm sorry for being late and having kept you waiting. Lì li: Méi guān xi. Nĭ jīn tiān zăo shàng shuì guò tóu le ba? Lili: It doesn't matter. You overslept this morning, didn't you? Mài kè: Shì de, ér qiě wŏ zhèng hăo găn shàng le dŭ chē gāo fēng qī. Mike: Yes, I did. And I hit rush hour traffic. Lì li: Yuán lái rú cĭ. Běi jīng tōng cháng zăo shàng dào lù hěn yōng dŭ. Lili: Oh, I see. Beijing's roads are very congested in the mornings. Mài kè: Wŏ bèi kùn zài chē liú zhōng. Wŏ shì zhe dă nĭ de shŏu jī, kě shì zhàn xiàn. Mike: I was stuck in traffic. I tried to call you on your mobile phone, but the line was busy. Lì li: Nà huĭr lăo băn zhèng zài hé wŏ tōng huà, bù zhì jīn tiān de huì yì ne. Li li: I must have been speaking with Boss at the time. He called to leave instructions for today's meeting. Mài kè: Lăo băn duì wŏ de chí dào yí dìng hěn shēng qì ba? Mike: Is Boss angry with me for being late? Lì li: Bié dān xīn, tā méi yŏu shēng qì. Dŭ chē jīng cháng fā shēng, kě yĭ lĭ jiě. Lili: Don't worry, he isn't. Traffic jams are so commonplace now. It's understandable. Mài kè: Wŏ xià cì huì zhù yì de. Wŏ zuì hăo gèng zăo yì diăn chū mén. Mike: I'll keep it in mind for next time. It would probably be best if I set out a little earlier. Lì li: Wŏ jiàn yì nĭ shàng shang nào zhōng, zhè yàng yĭ fáng wàn yī. Lili: I suggest using an alarm clock to avoid any mishaps. 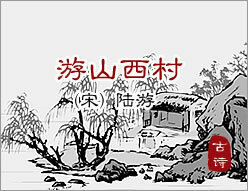 Mài kè: Zhè shì gè hăo zhú yi. Xiè xie nĭ de tí xĭng. Mike: That's a good idea. Thanks for the advice! Li li: Bú yòng kè qì. Fēng nián liú kè zú jī tún. Liŭ àn huā míng yòu yì cūn. Yī guān jiăn pŭ gŭ fēng cún. Zhŭ zhàng wú shí yè kòu mén.